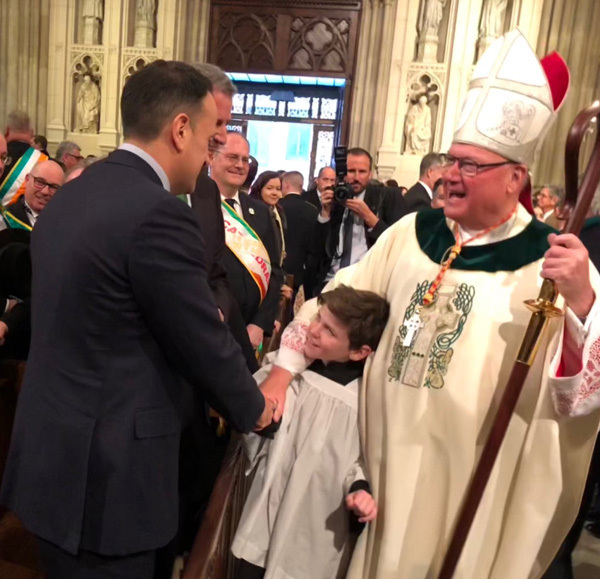 Yesterday, March 17, 2018, St. Patrick's Day, the Cardinal Archbishop of New York Timothy Dolan greeted Leo Varadkar, the Prime Minister of Ireland at St. Patrick's Cathedral, above, and posed with him during the annual St. Patrick's Parade, below first row. Mr. Varadkar is known for being a homosexual and boasts about this perversion everywhere. At the St. Patrick's Parade, for example, he marched with his partner alongside New York Governor Mario Cuomo, second row. In the third row, he poses on a vacation with his companion. In the fourth and fifth rows, he displays his homosexuality in "gay" parades in Ireland. The Irish PM is also pro-abortion. Thus, at the moment Ireland is fighting to maintain its anti-abortion laws against the pressure of the government, the prestige Card. Dolan lends to Varadkar is a tacit boycott of the Catholic position. In the referendum to take place in May to abolish the anti-abortion laws, many Catholic votes can change because of this Dolan's support. Notwithstanding Varadkar being a flagrant homosexual, Card. Dolan warmly shook his hand and posed with him, giving an indirect approval to homosexuality. This is but another scandalous action on a long list of public backings the Prelates of the Conciliar Church have given to this vice against nature, which cries to Heaven for vengeance.